Say my name. B. Nektar. You’re g*&damn right. This stuff will give Heisenberg a run for his money because this s#*t is tight, tight, tight! The coveted crystal green color comes from pure lime juice added to the honey and agave nectar. No gas masks necessary for this cook but tighty whities are always welcome. A word of warning, though, in case you really don’t know who you’re talking to: tread lightly in our territory. 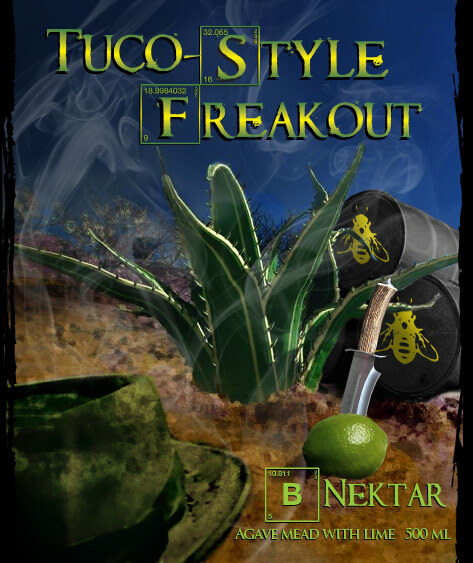 If you think you’re the one who knocks, you might find yourself on the wrong end of a Tuco-Style Freakout. Pairs well with roof pizza. Essential Elements - Orange blossom honey, agave nectar, lime juice and lime zest. Appearance - Pale green and crystal clear with a fizzy head that disperses swiftly to the rim. Experience - Tart lime engulfs the tongue followed by a creamy sweetness of honey and agave. Medium bodied with a lime pith bitterness on the semi-dry finish. A zip of acidity adds to the wonderful balance of the sweet, tart, and bitter flavors. Package: 500ml bottles (beer bottles with crown cap) and 1/6 barrel kegs.